NEW! Click here for posters! 1986 Panini Supersport #130, $75. 1988 Fournier Estrellas #1, $12. 1988 Panini Supersport #140 (Italy), $60. 1991 Sports Card News #9, S/O. 1992 Courtside College Flashback #4, $5. 1998 SI for Kids "Great Playoff Moments", $2. 1988 Fournier Estrellas #17, $5. 1990 Fleer AS#1, EX-NM, $0.50. 1990 Hoops #1, NM-, $0.30. 1990 Hoops #225, NM-, $0.30. 1992 Courtside College Flashback, $2. 1994 McDonald's Nothing But Net, $2.50. 1997 SI for Kids, NM-, $2. 1988 Fournier Estrellas #15, $5. 1993 Fax Pax #6, $1.25. 1997 SI for Kids (as Frankenstein), NM-, $1. 1986 Panini Supersport #131, $30. 1988 Fournier Estrellas #4, $9. 1988 Panini Supersport #138 (Italy), $25. 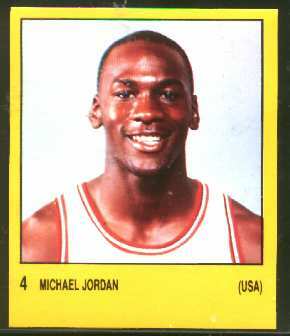 1990 Fleer AS#4, EX-NM, $1.25. 1991 Sports Card News #19, $1.95. 1993 Ballstreet (w/Pat Riley), $1.95. 1993 Great Western Forum Insert, S/O. 1996 SI for Kids, $3.50. 1988 Fournier Estrellas No# Rules, $25. 1988 Fournier Estrellas #22, $45. 1988 Panini Supersport #141 (Italy), BGS 8.5 NM-MT+, $350. 1990 Fleer AS#5, $10; NM-, $8. 1991 Sports Card News #2, $3.50. 1992 Sports Report #8, $2.95. 1993 Ballstreet No# (driving), $2.95. 1993 Ballstreet No# (walking), $1.95. 1993 Fax Pax #7, $3.95. 1993 Hot Stars 3-Card Uncut Sheet (w/Nolan Ryan, Frank Thomas), $15. 1993 Investor's Journal #35, $1.95. 1994 McDonald's Nothing But Net, $10. 1994 Question of Sport, $10. 1994 Upper Deck Rare Air #1, $1.95. 1998 SI for Kids "Best of 1998", $2. 1999 SI for Kids 4" x 7 3/4", $5. 2000 SI for Kids #871, $5. 2002 SI for Kids #149, $3; EX, $1. Nov 2001 Beckett Price Guide (Jordan cover), $2. 1993 Fax Pax #8, $3. 1993 Hot Stars Chicago National Promo, $5. 1993 Hot Stars Promo, $5. 1993 Hot Stars 3-Card Uncut Sheet (w/Frank Thamos, Manon Rheaume), $15. 1993 Pocket Pages Sample, $5. 1993 SI for Kids, $10. 1994 Skybox Blue Chips Promo (w/Nick Nolte), $5. 1997 SI for Kids, $3.50. 1999 SI for Kids, $1.50. 2001 SI for Kids, $1. 1991 Arena Hologram #5, $4. 1991 Sports Card News #6, $1.50. 1992 Courtside College Flashback #31, $2. 1992 Front Row Promo - Naval Academy Legends, $5. 1994 Hoops Preview No#, $2. 1995 SI for Kids, NM-, $2. 1996 SI for Kids (as child), $2. 2000 SI fir Kids, $1. Dave DeBusschere Baseball Card #247, EX, $5. Gail Goodrich #95, EX-, #0.35. Paul Westphal #120, EX, $0.45. Gail Goodrich #32, NM-, $0.50. Bill Bradley, $3; NM-, $1.50. Oscar Robinson, $3; NM-, $1.50. Jerry West, $3; EX, $1. Isiah Thomas, $5; EX, $3. Nick Anderson (R) #214, $0.25. Sean Elliott (R) #267, $0.25. Danny Ferry (R) #336, $0.25. Tim Hardaway (R) #113, EX, $0.50. Shawn Kemp (R) #279, $1.50. Karl Malone #292, EX, $0.10. Drazen Petrovic (R) #248, $0.75. Cliff Robinson (R) #250, $0.50. Dallas Mavericks Team Set, $1. Wilt Chamberlain & Co., $1. John Havlicek (warm-up suit), $0.60. Wilt Chamberlain insert card, $10. Kareem Abdul-Jabbar insert card, S/O. 1990 Brad Daugherty, NM-, $0.20. 1990 Moses Malone EX, $1. 1990 Reggie Miller, NM-, $3.50. 1990 J.R. Reid, EX, $0.25. 1992 Robert Parish, EX-NM, $0.75. 1993 Chris Mullin, EX, $0.20. 1993 Oscar Robertson, EX, $1.50. 1996 Juwan Howard, $0.80; NM-, $0.60. 1996 Alonzo Mourning, VG-EX, $1. 1996 Oscar Robertson, NM-, $2; VG, $0.75. 1996 Clifford Robinson, VG+, $0.25; VG, $0.15. 1996 Dennis Rodman, $2; VG, $0.50. 1997 Shawn Bradley, NM-, $0.50. 1997 Kobe Bryant (Rookies), $25. 1997 Kevin Garnett, NM-, $2.50. 1997 Allen Iverson (Rookies), $25. 1997 Kerry Kittles (Rookies), $2. 1997 Damon Stoudamire, $1.50; NM-, $0.95. 1998 Kobe Bryant, NM-, $4. 1998 Tim Duncan, NM-, $1.50; VG-EX, $0.50. 1998 Stephon Marbury, $0.50; NM-, $0.35. 1998 Keith Van Horn, $0.50. 1998 Antoine Walker, NM-, $1. 1999 Darrell Armstrong, $0.35; NM-, $0.20. 1999 Kobe Bryant (as Dracula), $5. 1999 Vince Carter, $0.75; VG, $0.15. 1999 Kendall Gill, VG, $0.10. 1999 Allen Iverson, $1.50; NM-, $1.25; EX, $0.75. 1999 Steve Kerr, NM-, $0.25. 1999 Alonzo Mourning, NM-, $0.50. 1999 Gary Payton (as Superman), $3; NM-, $2.50; VG, $0.50. 1999 Chris Webber, EX, $1. 2000 Kobe Bryant Super Card (3 1/4" x 10 1/2") w/Marion Jones, $3. 2000 Vince Carter (as Taz), $1. 2000 Alonzo Mourning (as child), $5. 2000 Glenn Robinson (as Scooby-Doo), $1. 2000 Jalen Rose, NM-, $0.50. 2001 Kobe Bryant, $3; NM-, $2; VG-EX, $0.50. 2001 Tim Duncan, NM-, $1; EX-NM, $0.75. 2001 Tim Hardaway, $0.50; VG-EX, $0.25. 2001 Karl Malone, $0.75; EX, $0.40. 2001 Stephon Marbury, EX-NM, $0.35. 2001 Tracy McGrady, $1; EX, $0.50. 2001 Latrell Sprewell, $0.75; EX, $0.50. 2001 Damon Stoudamire, NM, $0.50; NM-, $0.35. 2002 Kevin Garnett, EX-NM, $0.50. 2002 Pau Gasol, $2; EX-, $0.75. 2002 Robert Horry, $0.50, EX-NM, $0.30. 2002 Jason Kidd, NM-, $0.50. 2002 Gary Payton, $0.50; NM-, $0.35. 2002 Glen Robinson, NM-, $0.25. 2002 Ben Wallace, NM-, $0.50; EX, $0.25. 2002 Antoine Walker, $0.75; NM-, $0.65; EX-NM, $0.50. 2003 Tim Duncan, $2; EX, $1. 2004 Vince Carter, VG-EX, $0.25. 2004 Dirk Nowitzki, VG, $0.35. 2004 Michael Reed, EX (O/C), $0.25. 1995 Grant Hill A*, $4. 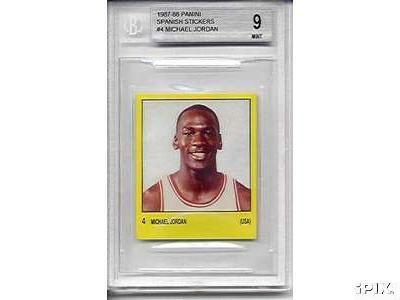 1996 Michael Jordan A*, $5. 1996 Scottie Pippen/Sheryl Swopes A*, $5. 1997 Charles Barkley A*, $2. 1997 Karl Malone A*, $2. 1997 Dikembe Mutombo A*, $1. 1998 Grant Hill A*, $2. 1998 Michael Jordan A*, $3. 1998 David Robinson A*, $1. 1999 Kobe Bryant A*, $3. 1999 Tim Duncan A*, $2. 1999 Michael Jordan A*, $3. 1999 Reggie Miller A*, $2. 2000 Vince Carter B*, $2. 2000 Jason Kidd A*, $3. 2001 Chris Webber B*, $3. 2002 Koby Bryant B*, $3. 2002 Tracy McGrady B*, $2. 1991 Courtside Kenny Anderson, $3. 1991 Courtside Anthony Avent, $0.25. 1991 Courtside Donald Hodge, $0.25. 1991 Courtside Alvaro Teheran, $0.25. 1991 Hoops Armon Gilliam, $4. 1991 Hoops Sidney Moncrief, $3. 1992 Front Row Larry Johnson, $1. 1992 Front Row Christian Laettner, $4. 1992 Front Row Collector's Club Christian Laettner, $6. 1992 Front Row Coverse Grandmama Larry Johnson, $1. Jason Kidd, Jalen Rose, J.R. Rider, $15. 1993 Hot Stars Alonzo Mourning, $1. 1993 Hot Stars Chris Webber, $3. 1994 Skybox Hakeem Olajuwon, $2. 1994 Skybox Blue Chips "Another Game, Another Loss," $2. 1994 Skybox Blue Chips "Two Old Friends," $2. 1994 Skybox Magic on Alonzo Mourning, $3. 1994 Skybox Ragin' Rookies Calbert Cheaney, $1. 1994 Skybox Ragin' Rookies Ervin Johnson, $1. 1994 Skybox USA Larry Johnson, $0.50. Pictures Dirk Nowitzki on cover, $2. 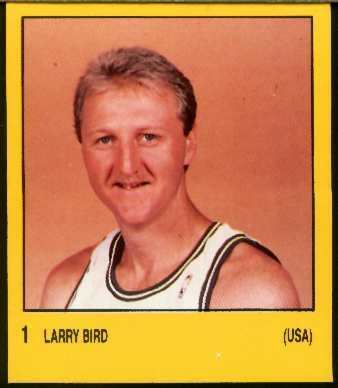 1994 McDonald's paper placemat picturing Larry Bird collector cup and fries, $1. 2003 Michael Finley Sprite can, $1. 2005 Wheaties box (18 oz.) San Antonio Spurs NBA Champions (Duncan, Ginobili), $5. 1996 Cheryl Miller, EX, $1. 1999 Cynthia Cooper (as Angel), $5; NM-, $4. 1999 Jennifer Gillom, NM-, $0.75. 1999 Ticha Penicheiro, EX, $0.50. 1999 Nykesha Sales, NM-, $1. 1999 Suzie McConnell Serio, NM-, $0.75; VG, $0.35. 1999 Teresa Weatherspoon, EX-NM, $0.75. 2002 Sue Bird, $3; VG-EX, $1. 2002 Chamique Holdsclaw, EX-NM, $0.75; EX-, $0.45; VG, $0.20. 2002 Lauren Jackson, $1.50; EX, $0.75. 2003 Shannon Johnson, NM-, $0.50. 2003 Diana Taurausi, $1; NM-, $0.75. 2004 Lauren Jackson, VG, $0.35. 2004 Diani Taurausi, PR, $0.05. 1986 Panini Supersport Catarina Pollini, $5. 1988 Panini Supersport (Italy) Catarina Pollini, $5. 1988 Panini Supersport Italian Team, $3; EX, $2. 1992 Classic World Class Athletes Jennifer Azzi, EX, $0.50. 1992 Classic World Class Athletes Katrina McClain, $1. 1996 SI for Kids Poster Sheryl Swoopes/Scottie Pippen (10 1/2" x 15 1/2"), $5. 2005 SI for Kids Poster Diana Taurasi/Carlos Beltran (10 1/2" x 14 1/2"), $2.